Piper is the rare artist whose practice is informed by her skills as a philosopher. The relationship between artists and philosophers is not often a close or easy one. Some great artists developed philosophical theories to guide their practice. But when Piet Mondrian or Henri Matisse spelled out their aesthetic theorizing, one is aware that however important these ideas were for their art, it’s not easy to understand them as freestanding philosophical arguments. And, conversely, when even the most distinguished philosophers write about art, almost always their concerns are distant from those of practicing artists. Artists and philosophers usually have different skills — and both activities tend to be all-consuming. 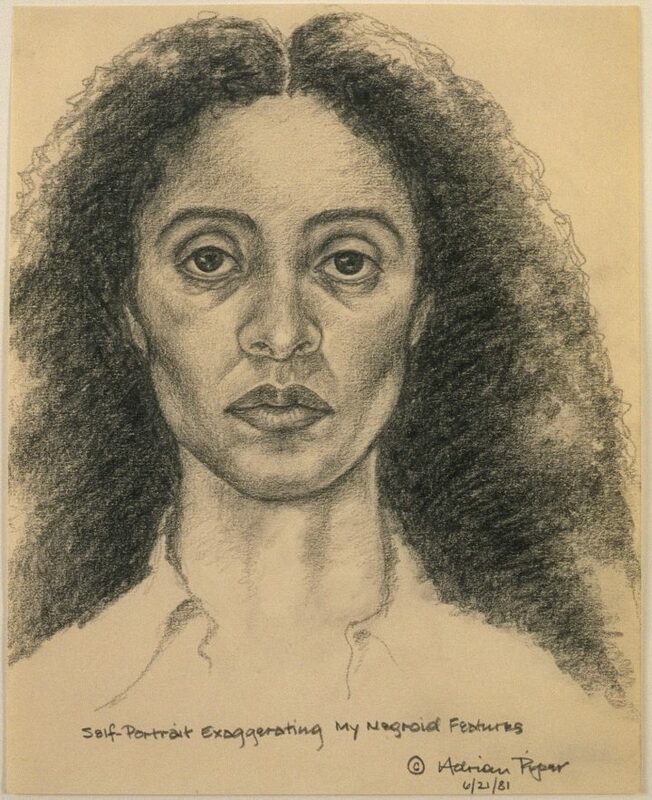 When a teenager, Adrian Piper read a great deal of philosophy and contemporary fiction, listened to much avant-garde music, and became a passionate film connoisseur. After studying at the School of Visual Arts, she became a successful conceptual artist, exhibiting in major commercial New York galleries, starting when she was only 21. At this time, she worked as an artist’s model for Raphael Soyer. And, the very same year, when told by a friend that she should read Immanuel Kant’s Critique of Pure Reason, she embarked on studies that led to a PhD at Harvard University, writing her thesis with the best-known American social philosopher, John Rawls, , and traveling to Heidelberg, Germany, to study Kant. (In general, speaking myself as a philosopher, Kant’s first critique is one of our most challenging, and most commented on texts. Understanding Kant, it has rightly been said, is an IQ test for philosophers.) She then embarked on a teaching career that would lead to professorships at such major universities as University of Michigan, Georgetown, UC San Diego, and Wellesley. Piper describes herself as an artist and a philosopher. Many artists read some philosophy, and some philosophers look seriously at visual art. That said, I cannot think of anyone else, either a historical figure or some present-day person, who is both a major artist and also a practicing, skilled academic philosopher. What needs to be added is that, as she has said, Piper is an artist whose practice is informed by her professional skills as philosopher. In her philosophy lecture “The real thing strange” published in the catalogue of her recent retrospective at the Museum of Modern Art, New York, she speaks of her “project of directing you to that place in the mind where my art work lives and where you have to live and be comfortable, if you want to meet any contemporary artwork, including mine, on its own territory.” And she goes on to offer a lucid, highly subtle account of how to correctly understand contemporary art — an analysis that in some significant ways takes issue with Kant’s own account of aesthetic theory. Piper’s essay deserves close attention, for understanding its argument seems essential to any full evaluation of her art. Would you like to know why I left the U.S. and refuse to return? As she rightly notes, there are a number of students in philosophy like her, a “misguided troublemaker.” When I taught, I occasionally had students somewhat like her, who always were exciting and worth engaging in prolonged discussion in class and after. I remember one of my favorite students, who just wouldn’t shut up. I loved having her in the class, because she forced me to think hard. Is it surprising that now she’s a successful professor? Philosophers love to argue — it’s what we do. When she arrived at Wellesley College — which, in this memoir, is simply called The College — she was the only tenured African-American woman on a faculty of 200. And so it’s surely unsurprising that her situation was full of conflicts. That said, only a true philosopher, I suspect, would explain such difficulties as she does by reference to “the mistake Nietzsche warned against, of demonizing others by projecting onto them one’s own repressed aggression.” When she speaks of her love of the students she taught at Wellesley for 15 years, any reader will sense that she was a magically charismatic professor. I owe everything I am to my birth, upbringing, and education in the United States. So I would have preferred my achievements to be a source of pride to my country of origin. Unfortunately, it is not set up to tolerate achievements like mine from someone like me, because people like me are not supposed to exist. You really should read this book because it is brilliantly lucid, entirely engaging, and (I deeply regret to say) all too revealing about the limitations of American academic life. Reading it made me extremely sad. Even granting, as Piper herself repeatedly allows, that she was not easy to get along with, why was not more allowance made, and more support offered, for an artist and philosopher who is so obviously, uniquely gifted? What a great loss her self-exile makes for our country. Escape to Berlin is destined to become a classic American memoir. When, in what I hope are happier times, people want to understand our racism, they will come back to study this great book. Author’s Note: The narrative of Escape to Berlin deserves to be supplemented with Piper’s “Personal Chronology,” published also this year, in her MoMA exhibition catalogue, A Synthesis of Intuitions, which fleshes out some of the details. Escape to Berlin is published by APRA Foundation and is available on Amazon and other online retailers.